This post is about voltage regulation of synchronous machine by zero power factor method or potier method. Already in the previous posts we have learnt what is meant by voltage regulation of a synchronous machine. To see this post click on the below provided link. 1. In the before methods that is voltage regulation of synchronous machine by e.m.f method or synchronous impedance method and voltage regulation of synchronous machine by m.m.f method or ampere turn method drop due to armature reaction is considered as leakage reactance drop and drop due to leakage reactance is considered as armature reaction drop respectively.So these two methods are away from reality and doesn't give correct value of voltage regulation. 2.But while calculating voltage regulation of synchronous machine by zero power factor method or potier method we separate armature leakage reactance and armature reaction effects and calculate voltage regulation so we get almost correct value of voltage regulation by zero power factor method or potier method. 2. Zero power factor test. Now let us discuss how to conduct open circuit test on synchronous machine. Below diagram shows circuit diagram for conducting open circuit test on synchronous machine. 1. Armature is star connected. 2. A potential divider is connected in series with the dc supply this whole setup is connected in series with the field which helps to adjust the excitation of the field. 3. A group of three parallel connected pure reactors are connected to a TPST switch S.
4. Switch S is kept open. In this way circuit connections are to be made to conduct open circuit test on synchronous machine. 1. Make connections as per the circuit diagram. 2. Now with the help of prime mover make the synchronous machine to run at synchronous speed. This speed is to be maintained throughout the experiment. 3.Now switch on dc supply.With the help of potential divider vary the excitation from zero to rated value step wise and get the open circuit e.m.f from the voltmeter . Note down all the values which helps you to draw open circuit characteristics of synchronous machine. 4. open circuit characteristics of synchronous machine is a graph between If and (Voc)ph. (Voc)ph = open circuit voltage per phase. Now let us discuss how to conduct zero power factor test on synchronous machine. Below diagram shows circuit diagram for conducting zero power factor test on synchronous machine. 4. Switch S is kept closed. In this way circuit connections are to be made to conduct zero power factor test on synchronous machine. 3. As the switch S is closed power is delivered to the purely reactive load by synchronous machine. The power delivered to the load is to be maintained at its rated full load value by adjusting the variable reactance of the reactor(inductor) and also by varying the excitation of field. 4. As the load is purely reactive load alternator will operate at zero power factor lagging. 5. Here the values to be noted are not many only two values are required to plot the graph for zero power factor test. What are the requirements for plotting the graph to calculate the values of leakage reactance drop and armature reaction drop ? 1. Firstly we need to draw the open circuit characteristics of synchronous machine curve . This can be obtained by plotting the graph between open circuit voltage against field current whose values are obtained by conducting open circuit test on synchronous machine. a) At short circuit condition field current required to give full load short circuit armature current. b) Field current required to give rated terminal voltage while delivering rated full load armature current. 1. Draw the open circuit characteristics curve. For different values of field current plot its corresponding values of open circuit voltage whose values are already tabulated by conducting the open circuit test on alternator. 2. Now plot the full load zero power factor curve by using two values. a) Field current at short circuit full load zero power factor armature current which is denoted by A.
b) Field current required to give rated terminal voltage while delivering rated full load armature current which is denoted by P.
3. To the open circuit characteristics curve draw a tangent through the origin. This is called air gap line it is shown in the graph by dotted line OB. 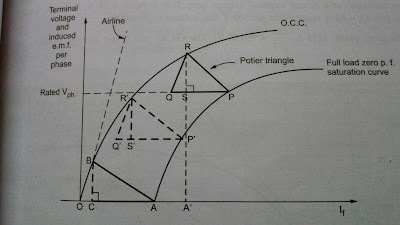 4.Now draw a line PQ which is parallel and equal to OA as seen in the graph. 5.Now draw a line parallel to air gap line from Q such that it intersects the open circuit characteristics curve at R.
6. Now join RQ and RP. 7. 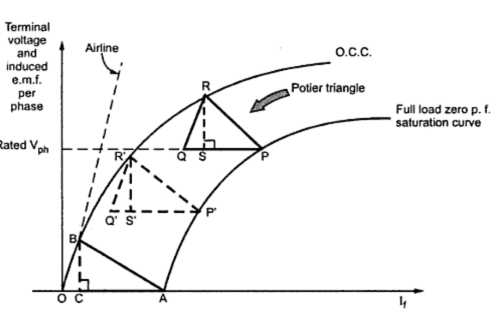 The triangle obtained is called potier triangle. 8. Now from point R draw a perpendicular on to QP. It touches QP at point S.
9. The potier triangle obtained is constant for a given armature current. 10. Now draw a line parallel to PR through point A such that it meets the open circuit characteristics curve at B. 11. Now draw a perpendicular to OA from B which intersects OA at point C.
12. 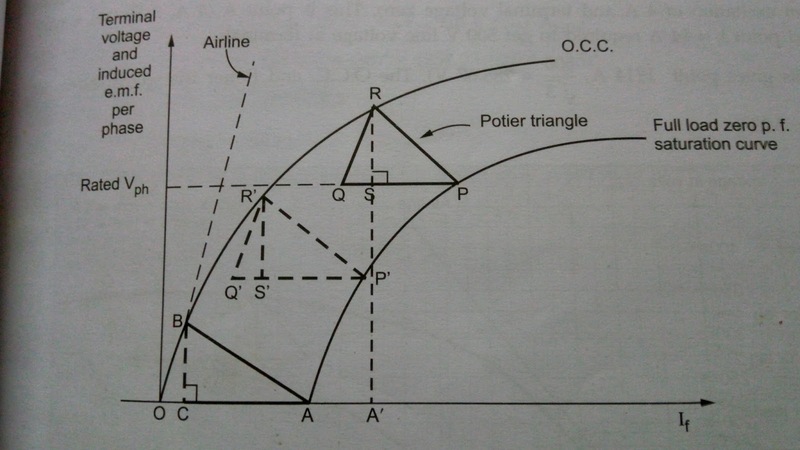 Now triangles OAB and PQR are similar triangles. 13. The length of the perpendicular RS gives the voltage drop due to armature leakage reactance i.e. XLph. 14. The length of PS gives field current required to overcome demagnetizing effect of armature reaction at full load. 15. Length SQ represents field current required to induce an e.m.f for balancing leakage reactance drop RS. length (RS) = length( BC) = (Iaph)f.l × Xlph. Xlph is called potier reactance. In order to determine voltage regulation by zero power power factor method or potier method using potier reactance we need to draw a phasor to get required values i.e Eph and Vph. 1. Take the rated terminal voltage Vph as reference vector. 2. Depending upon the power factor cos𝞍 calculate value of 𝞍 and draw current phasor Iph lagging or leading Vph by an angle 𝞍. 3. Draw IphRaph voltage drop to Vph and it should be in phase with Iph. 4. Volatge drop IphXlph is to be drawn perpendicular to IphRaph vector and leading this IphRaph at the extreme point of Vph. 5.Raph is measure by applying known dc voltage to the Raph and calculating the current value Raph can be obtained by Raph = V/I. 6. Here Xlph is potier reactane. 7.Now from open circuit characteristics graph obtain value of excitation Ff1 corresponding to E1ph vector. 8.This Ff1 gives excitation required to induce e.m.f without considering the effect of armature reaction. 9. Field current Far required to balance armature reaction can be obtained from potier triangle. 10. Far = length ( PS ) = length ( AC). 11. Now the total excitation required is the vwctor sum of Ff1 and Far. 12. The procedure to obtain this is same as the procedure used in calculation of voltage regulation of synchronous machine by m.m.f method or ampere turn method. You can see this post on voltage regulation by m.m.f method or ampere turn method from the below provided link. 13. Draw a vector Ff1 leading E1ph by 90°. 14. Iph anf Far are in same phase. Now Add -Far and Ff1. 15. Far can be obtained by drawing a vector opposite to Iph. 16. The total excitation to be supplied by field is nothing but Fr which is the resultant m.m.f or field m.m.f. 1.Total excitation Fr is calculated by adding -Far and Ff1. 2. Now for this Fr corresponding value of e.m.f is calculated from open circuit characteristics graph. To understand refer calculation of voltage regulation of synchronous machine by m.m.f method or ampere turn method this link is already provided above. 3. length CD represents drop due to armature reaction. 4. Now draw perpendiculars from A and B onto current phasor. It intersects current phasor at points G and H respectively. 5. Now we obtain a right angled triangle OHC. 6. Now E1ph can be determined analytically by using pythogerous theorem. 7. In the similar manner we obtain Eph by using pythogerous theorem. (Eph)2 = (Iph)2 + (Iph Rph + Iph Xph)2+ Armature reaction drop. Here we get almost accurate value of voltage regulation as we have considered drops due to leakge reactance and armature reaction separately. Because of few assumptions made we get small deviation of voltage regulation from actual value of voltage regulation. 1.Armature resistance is neglected in over all calculation of voltage regulation of synchronous machine by zero power factor method or potier triangle method. As this value is there will be no significant error due to this assumption. 2. Perfect reactor(inductor) is not present so practically we don't get zero power factor load. 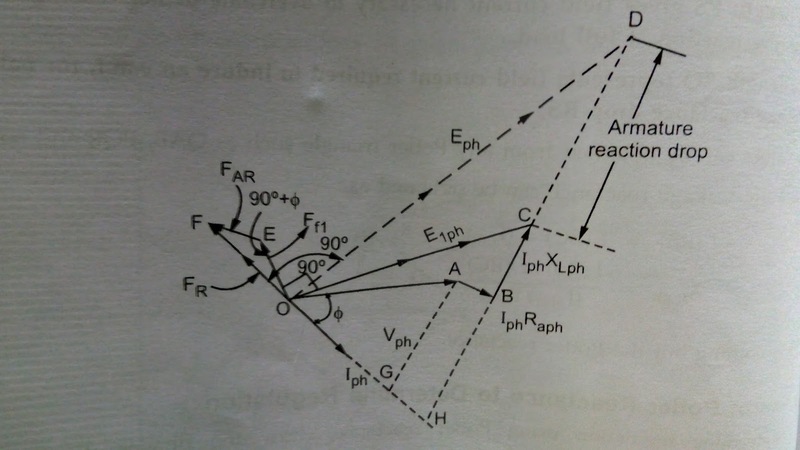 look at graph that we have considered for calculating potier reactance. 3. In this we have assumed distances RS , R'S' and BC as equal. Which means that leakage reactance drop in power factor test and short circuit test are equal. But this cant be same as the excitation under short circuit condition i.e at point A is OA while for zero power factor test i.e, point P is OA'.Excitation OA' is higher than OC. P corresponds to saturation condition and has larger leakage flux. As this value is assumed to be unchanged we get error due to this. In this way we calculate voltage regulation of synchronous machine by zero power factor method or potier method.